Shop online or find a store near you to buy Proper's Pickles. Like father, like sons. Though Pejmon and Bijan Noori's father has been in the United States for 40 years, his Iranian heritage has had a strong influence on his sons. "Our dad grew up on big farm in Iran," relates Pejmon. "In summer when they had a surplus of veggies, they canned and pickled them for a year-round supply. Iranians call their style of pickling Torshi (pronounced torshee)." "My brother and I grew up sharing time in the kitchen with mom and dad. Dad had a separate fridge in the garage, and probably 80% of it was pickles. However, he's one of those cooks who never has a recipe, so it can be difficult to replicate what he does." Since the family always had good, fresh pickles at home, they thought all families did. During college, when a roommate served store-bought pickles, Pejmon looked at the ingredient list and couldn't figure it out. "We made pickles all the time, and we didn't put that stuff in them." To get good pickles, the brothers would raid dad's fridge. Then they decided to learn how to make them on their own. Their pickles were a huge hit; friends asked for them, and as poor college students, they gave pickles as gifts. After they graduated from Cal State Fullerton with business degrees, Pejmon and Bian took different career paths in corporate marketing and insurance. "After a while I realized that I didn't want to work for a big corporation. I went to Thailand for a year, teaching English and thinking about my options. It seems that my brother and I were destined to eventually go into business together." About a year after Pejmon returned from Asia, the brothers started Proper's Pickle. "As we got older we understood all that went into the delicious pickles dad made. We soon realized the challenge and discipline we had to have in the kitchen for a consistent product." The brothers started with classic garlic dills. What made theirs so good was that they used the small "Persian" cucumbers as well as fresh garlic cloves and fresh dill sprigs. 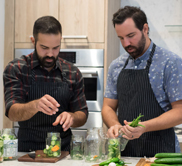 "We believe that using those specific cucumbers is one of the biggest differences between our product and other pickles. The common pickling cucumbers can get sort of rubbery and leathery, but Persian cucumbers are fresh and crunchy, which results in a much more fresh and crunchy pickle. That's what we are all about!" Selling at farmers markets has been good market research, and they have combined customers' suggestions with their own ideas as they've expanded their flavors. "Though Iranians don't eat spicy food, our maternal American grandfather loved hot sauce, and we live in Southern California, where Mexican chilies are influential. So, we created a pickle spiced with fresh habanero chili. Then we pickled fresh serrano chilies, which are very hot, and they're a customer favorite. Personally, I'm not a big cauliflower eater," says Pejmon, "but our pickled cauliflower has become my favorite." The Noori family is very close knit, and part of the satisfaction of Proper's Pickles has been carrying on a family tradition. "We're very motivated to do this for and with our family." 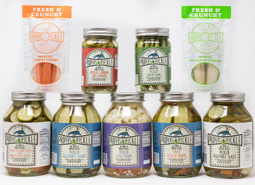 Another motivator is to introduce a larger market to truly fresh and natural pickles. "Our family believes that what you put into your body makes a big difference in what you can put out into the world - eat good, feel good, live good." "People who don't like pickles just haven't had really good pickles," Pejmon says with a smile.